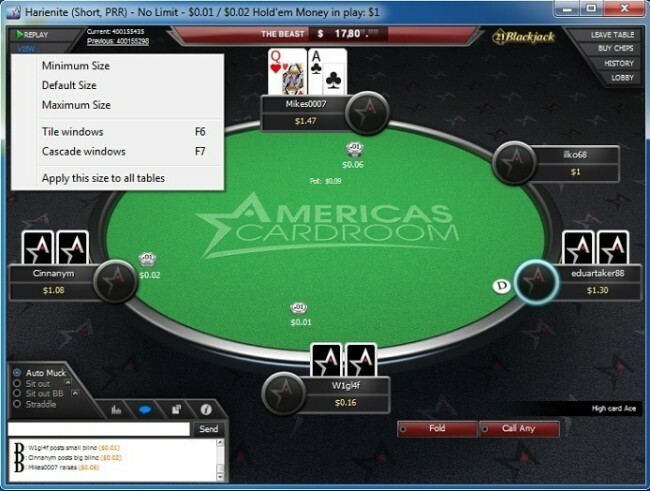 Americas Cardroom Review: $1,000 Free Bonus Money Available to New Players! With a $1,000 first deposit bonus, an Elite Benefits rewards program that offers regular perks to dedicated players, and The Beast cash game leaderboards, Americas Cardroom certainly knows how to treat its players. Add in speedy withdrawals, including Bitcoin payments, and the real question becomes: Why not play at Americas Cardroom? When you create your new account, remember to use the bonus code FTR1000 so that you qualify for the best possible bonus on your deposit. 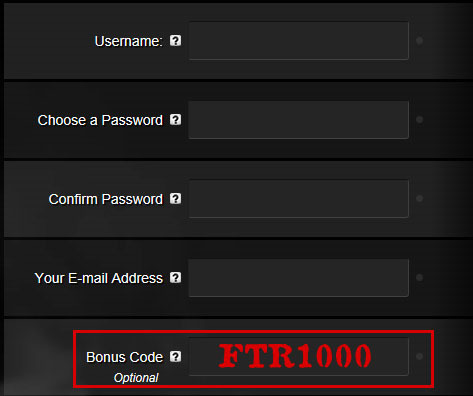 As long as you’ve entered the FTR1000 code in the appropriate field when registering your new account, Americas Cardroom will reward you with a 100% match on your first deposit, up to a max of $1,000. As you play whatever poker games you like, you’ll begin to accumulate Award Points (APs). You’ll get 5.5 APs for every dollar in rake contributed or paid in tournament fees. For every 27.5 points you earn, you’ll be able to release $1 in bonus funds. Your available bonus cash will begin to be tallied up in the Bonus Management section of the poker software. To convert it into real money, you can simply press a button to redeem your bonus and turn it into cash. You have 60 days from the time of your deposit to unlock as much of this bonus as you possibly can. You’ll need to earn 27,500 Award Points to clear the entire $1,000 bonus amount, which corresponds to $5,000 in rake paid. You’ll thus be getting 20% value back from the bonus. This is a bit on the low side as far as online poker bonuses go, but remember that you’ll be participating in the Elite Benefits Reward Program (described below) at the same time, so your total cashback percentage may be substantially higher. Also bear in mind that the frequent $1 bonus intervals mean that you’ll never have the dismal experience of clearing most of a sizable bonus portion and then failing at the last moment. As you play more and more at the tables, you’ll receive Rank Points, which will establish your position in the Elite Benefits program. As you progress through the ranks, starting at Lieutenant and ending up (hopefully) as a 5-Star General, you’ll get Combat Points to spend. The higher your rank, the more Combat Points you’ll receive per Rank Point earned. Use your points in the store to receive instant cash, tournament dollars, and more! At the highest levels, players even receive free live tournament packages and special Levels of Distinction cash payments. Check out our Elite Benefits review for more information. Whenever you play a Sit & Go or On Demand tournament at Americas Cardroom, part of the fee will go towards the Sit & Crush race. You’ll receive points toward the leaderboard based upon the fees you pay without reference to your performance in the tourney. At the end of each week, the top players on the leaderboard will receive cash prizes and free entries into satellite tournaments. Because the prize pool depends upon the total entry fees paid during any particular week, the prizes and number of players who win will vary. Each race runs from Saturday to Friday ET. While SNG grinders get to drool over the Sit & Crush leaderboard, cash players aren’t left out in the cold. The Beast rake race is funded by a portion of the rake paid at any cash table (excluding heads-up games), and you’ll receive points towards the leaderboard based upon your contribution to the jackpot. At the end of every Saturday-through-Friday period, the top individuals on the leaderboard are rewarded with cash prizes and free satellite tournament entries. Although the payouts will change from week to week, the current Beast cash prizes appear to be an order of magnitude higher than those for corresponding positions in the Sit & Crush leaderboard. If you’re the type of person who likes to know about all the bonus details before making a deposit, then be sure to read our Americas Cardroom Bonus Code review. 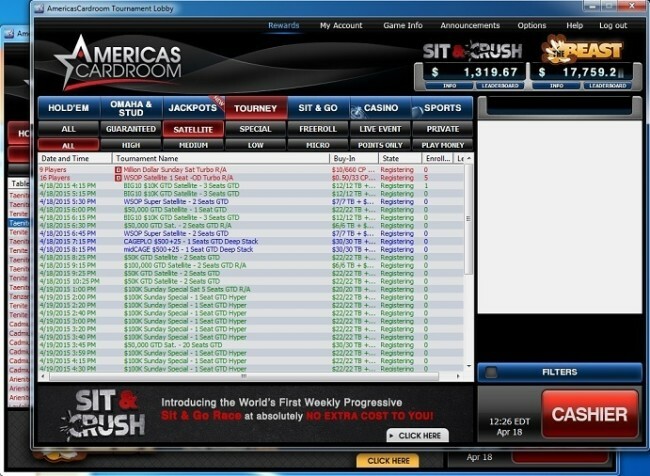 Americas Cardroom was an early entrant into the online poker market, opening up in 2001. The brand was owned by the highly respected sportsbook BetCris and operated using software provided by Dobrosoft. 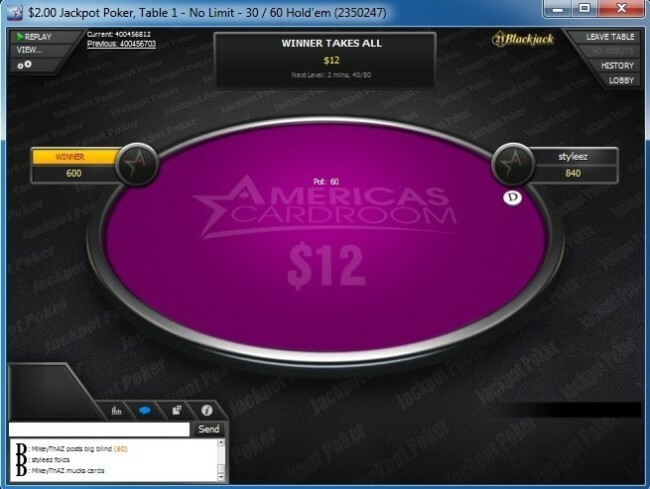 Americas Cardroom quickly earned a reputation as being a fine place to play virtual cards. After four years, the decision was made to move over to the Ongame network in 2005 in part due to the low levels of player traffic on Dobrosoft. However, the new platform was short-lived; Ongame decided to stop accepting American players after the UIGEA was passed in 2006. Americas Cardroom exited the market in an orderly fashion, and the brand name was retired. Meanwhile, Doyle’s room had been in operation since 2004. This site featured Doyle Brunson, one of the most legendary names in the game, as its sponsored pro. It began on the Tribeca Network, but left when Tribeca closed to new American players in the wake of the UIGEA. After a brief sojourn to the Microgaming Network (now called MPN), it jumped to the Cake Poker Network (rebranded to Revolution Network). This lasted a couple of years, but Doyle’s Room switched again to the Yatahay Network (now called the Winning Poker Network). The events of Black Friday in 2011 hit Doyle’s Room hard, and management decided to close up shop. At the same time, Doyle Brunson distanced himself from the site and withdrew permission to use his name in connection with it. Some players started reporting payout delays, and there was serious speculation that Doyle’s Room wouldn’t be able to honor its financial commitments. After sitting on the sidelines for five years, the people behind Americas Cardroom decided to re-enter the poker market. They purchased the assets of the now-defunct Doyle’s Room and opened up shop on the Winning Poker Network. Player balances were transferred over from Doyle’s Room and were made available on the new site. In a twist of fate, the software used by the Winning Poker Network is derived from the original Dobrosoft software, so Americas Cardroom, after 10 years and plenty of network changes, has come full circle back to (almost) its original platform. 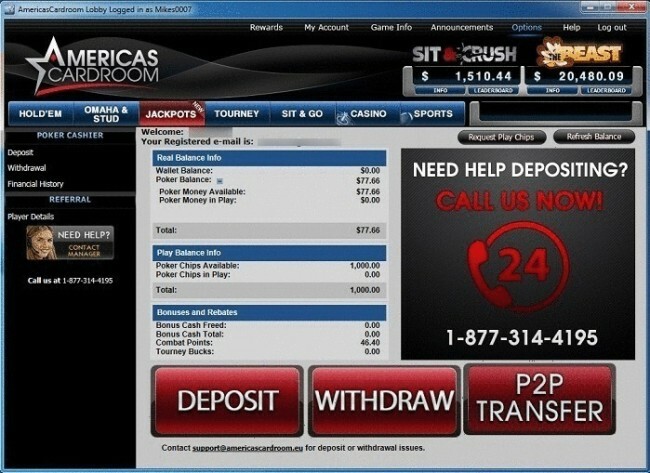 Since relaunching in 2011, Americas Cardroom has served players around the world, continuously for four years. It has become known for the speed and reliability of its payouts as well as a willingness to try out new and innovative promotions. Players aren’t restricted to poker alone. There is a casino and sportsbook, so you can get all your gambling needs taken care of in one place. 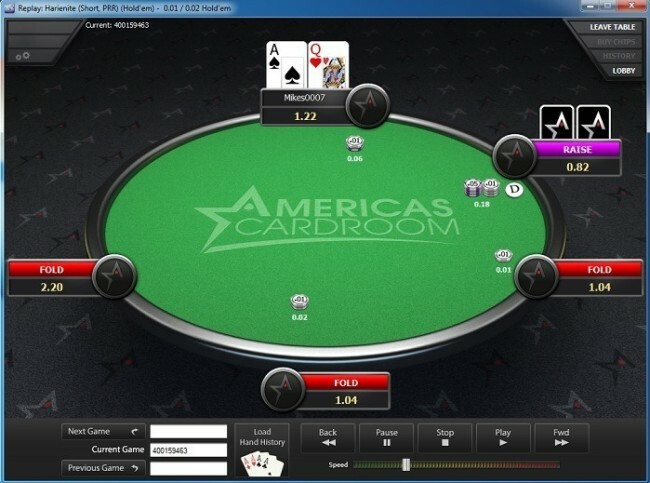 The software used at Americas Cardroom is standard for rooms on the Winning Poker Network and replaces the clunky, 3-D poker client that was previously used when the network was called Yatahay. Unfortunately, it’s only available for Windows machines, and there’s no instant-play or mobile version. Although there aren’t many advanced features, there’s nothing important that’s lacking either. The lobby at Americas Cardroom has categories on top with subcategories beneath. You can therefore easily get to the games you want. There are several columns of statistics on the games presented, and you can organize according to a specific stat by clicking on the column header. Strangely, if you click on the “Tourney” or “Sit & Go” tabs, another window pops up containing the lobby for those games. This is an unusual way of presenting the information that is slightly annoying and doesn’t really serve any purpose. The lobby window takes up a lot of space, and there doesn’t seem to be any way to resize it. If you’d like to filter the games, you can click towards the bottom-right on “FILTERS.” This will bring up a box allowing you to select certain criteria for the games you want to see. You can filter by different metrics depending on what type of game (cash, sit & go, or tournaments) you’re looking at. The tables at Americas Cardroom, fortunately, are resizable, so you can arrange and configure them around your screen however you’d like. In fact, the “View…” menu on the top-left of the table contains features to make multitabling easier, like tiling, cascading, and applying the current table size to all tables. 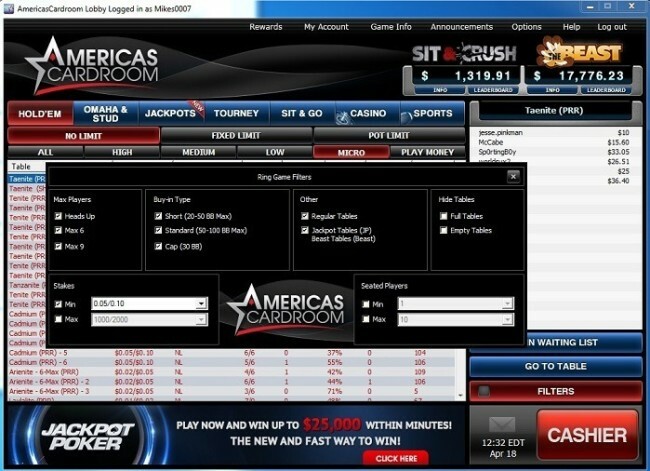 Other features of the tables include preferred seating, auto-buyin, auto-topup, and bet-size buttons. You can press F1, F2, or F3 when it’s your turn to act to fold, call, or raise respectively. You can access most of these and other features by clicking on the symbol that looks like a couple of gears on the top-left of the table. This will bring up an Options menu. While you’re playing, you’ll see a link to the previous hand near the top of the table. Click on this to bring up the Hand History interface. From within this window, you can not only access prior hands, but also control all options relating to hand histories. You’ll see a list with hand numbers on the left and additional information about each hand in each column. Click on a hand that you’re interested in, and the hand history will be displayed in text form in the bottom half of the window. Click on the button labeled “Replay Hand” to bring up the graphical replayer. Within this replayer, you can view the hand as if it were actually happening in real-time. Use the VCR-style controls at the bottom of the window to pause, step through the action, or stop the playback. If you want more information regarding every aspect of the Americas Cardroom software, be sure to take a look at our Americas Cardroom Download overview. As a member of the Winning Poker Network, Americas Cardroom shares player traffic with Black Chip Poker, True Poker, and other network skins. As of April 2015, the network is ranked 16th among all poker sites and networks. There are about 525 players online on average, with peak traffic figures climbing above 950. The most popular day on the network seems to be Tuesday. The time of day with the most traffic is typically around 10:30pm ET although this varies and is sometimes an hour or two earlier or later. No Limit Hold’em cash games are spread between $.01/$.02 and $25/$50, although action tends to peter out once you get above the $1/$2 level. 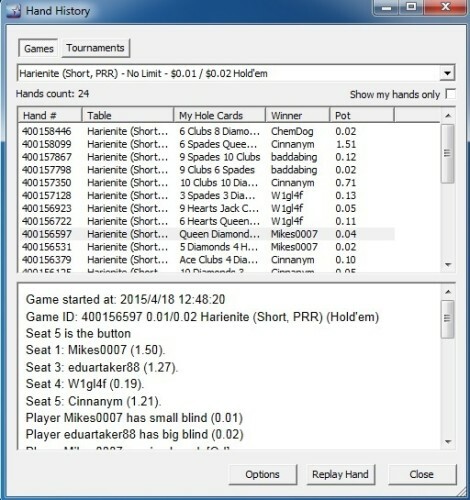 Microstakes players will often find a dozen or more games running at their stakes. Be aware that Americas Cardroom offers CAP tables, short-buyin tables, and regular tables – all in 9-max, 6-max, and heads-up sizes. This means that you might have to be willing to mix up the types of games you play if you wish to get all the action you can. There might be a couple of tables of LHE running, and other cash games that get some action are PLO, PLO/8, and NLO/8. You may find a dozen or so games running at PLO and perhaps half that number at O/8, both NL and PL combined. This action is concentrated at the microstakes. Limit Omaha/8, 7 Card Stud, and 7 Card Stud/8 are all listed in the lobby, but these games seldom attract enough players for more than a couple of tables to run at a time. Indeed, it’s not uncommon to find zero tables running of some of these variants. Sit and gos range from $1.50 + $0.11 to $1,200 + $15. As you would expect, there are heads-up, 6-max, and full-ring tourneys. There are usually multiple SNGs running at the $10 + $1 and $5 + $0.50 levels, but the higher SNGs fill only sporadically. Most SNGs are No Limit Hold’em, but Omaha Hi and Omaha Hi/Lo are also offered. The tournaments at Americas Cardroom include the occasional freeroll and microstakes events with buyins of less than $1. The most expensive events on the weekly schedule occur on Sundays. There’s a $100,000 guaranteed Sunday Special tourney that costs $200 + $15 to enter and a $20K guaranteed $500 + $30 High roller event. Smaller tournaments may draw up to 1,000 participants while the more costly ones attract only a few hundred. Americas Cardroom sometimes runs series, like the Online Super Series (OSS) and High Five events. Some of the more popular of these series events draw more than 500 entrants. Be on the lookout for the $500 + $40 Million Dollar Sunday tournaments. These events run once every few months and come with a mammoth $1,000,000 guarantee! This is one of the largest recurring online poker tournament, so it’s perfect if you like high-stakes action and seven-figure prize pools. One of the innovations pioneered by the Winning Poker Network is called “On Demand” tournaments. These are listed in both the SNG and MTT lobbies. Similar to a SNG in that they fire once a preset number of players enters, they then change to become like an MTT because there’s a late registration period during which more players can join. There are $10 freeroll on-demand tournaments running around the clock. The rest of the on-demand tournaments currently offered come with buyins of $11 or less, so they’re great if your bankroll is strapped for cash. Winning Poker Network has joined the bandwagon of poker sites running lottery-style SNGs by introducing its Jackpot Poker games. They’re listed in a separate lobby tab and are currently available at $2, $5, and $40. Each Jackpot game is a three-handed hyperturbo. Upon starting, the prize pool is randomly multiplied by a factor between 2 and 2,500. This means that if the random number generator gods smile upon you, you could buy in for $40 and end up playing for a prize pool of $100,000! These contests are usually winner takes all. If, however, the multiplier chosen is 100 or more, then the payout distribution is 75%/15%/10%, so everyone wins something. With the included “Deal” option, this can be flattened to 40%/30%/30% if every player agrees. If you love free money, but hate the bingo-style play in freerolls, then Americas Cardroom’s Freebuy tournaments may be right for you. These events are free to enter and often come with sizable guaranteed prize pools. People can rebuy and add-on by paying a stated amount, so this format combines features of freerolls and regular tournaments. The Cage is another unique offering brought to us from the inventive minds at the Winning Poker Network. This non-traditional game aims to combine the best features of cash games and tournaments. The way it works is that there are only a few levels of blinds, and the game ends at a predetermined time. After the specified amount of time has passed, everyone who still has chips remaining will receive a payout proportional to their total chipstack. The CAGE only runs intermittently at various levels, but it is sometimes as large as $5,000 + $100. ACR offers a few convenient methods that anyone can use: Visa card, Bitcoin, Western Union and Moneygram. In addition, players around the world have access to other popular means of depositing, including Neteller and Skrill. The specific methods available to you will very depending on your location, and you can always ask support if you have any questions. To fund your account, click on the red cashier button on the bottom-right of the poker lobby. This will bring you to the cashier section of the poker client. Click on the big, red “DEPOSIT” button, and a web page will launch in your browser. 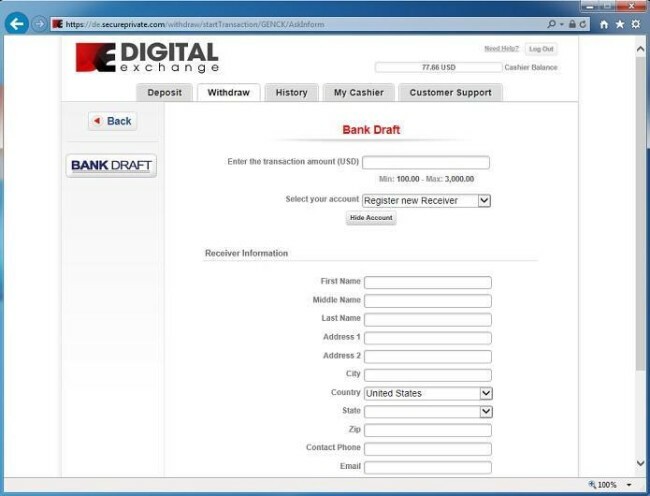 Select your preferred means of making a deposit from the options on the left of the page. On the subsequent screens, you’ll get a chance to confirm that all the information you entered is correct and change anything that’s wrong. Once you submit your deposit, you’ll be ready to play poker for real money. Withdrawal methods available are Bitcoin, Western Union, Moneygram, Pay2Card, Bank Draft (Check), and Debit Card. Some of these methods incur quite substantial fees, which can be as high as $110 depending on the amount of the cashout. Players can also choose other methods, like Neteller and Skrill, that they can use. The debit card option is one that’s very convenient for players. The way it works is that Americas Cardroom will send you a debit card in the mail one single time. 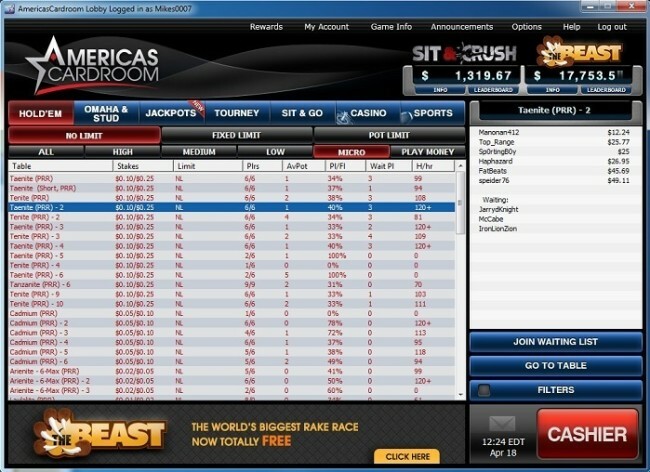 From then on, when you request a withdrawal via this method, the poker site will simply load the funds onto your card. Players often report getting their money in less than two days via debit card! The only part of this process that may take a long time is the initial wait to receive the actual card. 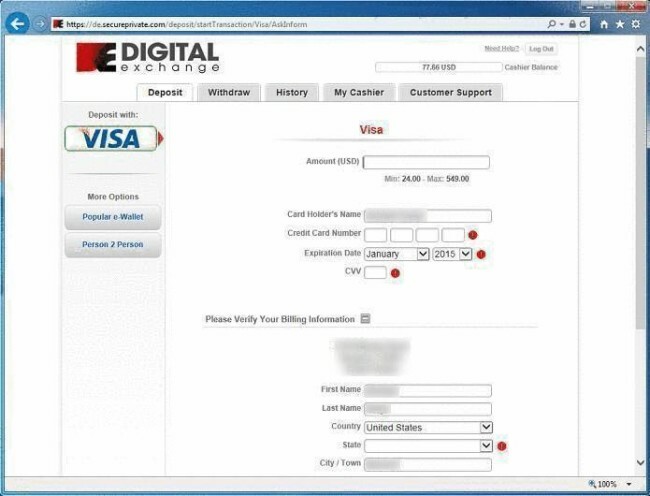 To begin the withdrawal process, click on the red “Cashier” button within the poker software. 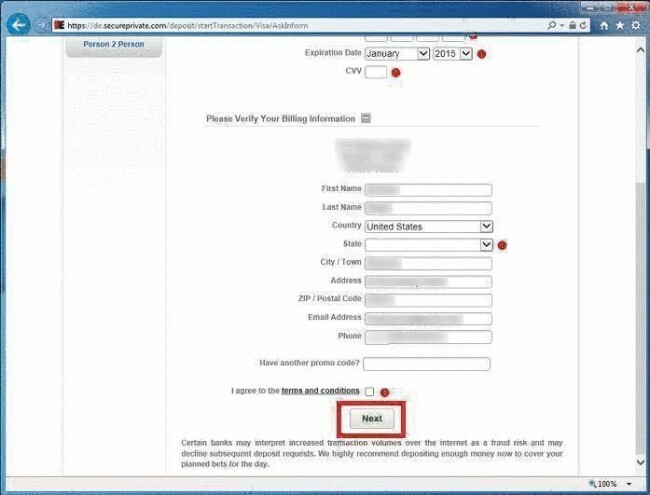 Then click on “Withdraw.” You’ll be taken to the withdrawal webpage to complete the transaction. Select the method you’d like to use from the list at the left. The withdrawal form will then appear for you to complete. Once you’ve filled in all the info, click on the green “Next” button to proceed to the next pages. Continue through the next screens until your withdrawal request is completed, and you’ll soon have your money in hand. ACR prefers that you scan your paperwork, but digital photos of the documents are also permissible. When you’re ready to send these files to the poker room, you can email them to security@americascardroom.eu or send them via fax to 1-888-902-2541. Americas Cardroom tries to complete the account certification within an hour of receiving the appropriate images, but it may take up to 24 hours. Americas Cardroom is behind the curve when it comes to mobile compatibility. There’s no dedicated mobile app, nor is there an instant-play, web-compatible option either. Customer support is available at Americas Cardroom 24 hours a day. You can call toll-free at 1-877-314-4195 or use the live chat feature available on the website. There’s also a webform allowing you to get in touch with support staff via email. It’s a rare online poker site that constantly tries out new types of promotions and tournaments, but this is exactly what Americas Cardroom does. Between the first-deposit bonus, Elite Benefits rewards program, frequent recurring and one-off promotions, and speedy cashouts, Americas Cardroom has almost everything a player could want or need.